This is not one of the modules examined on this course but mythology underlies everything we do in Classical Civilisation. We study the gods and heroes and the myths that grew up about them. We then see those myths in action in the plays. We see them sculpted on temples and painted on vases. They are referred to by the philosophers and politicians. What do you make of the relief sculpture pictured above right? It looks like a friendly embrace between man and woman. But some people think it shows Menelaus preparing to make get even with Helen - the woman whose face is said to have launched a thousand ships. Her affair with Paris was the reason for the outbreak of the Trojan War. However, we know from other sources, that Menelaus forgave his wife and was so stunned by her beauty that he dropped the sword in mid stroke! 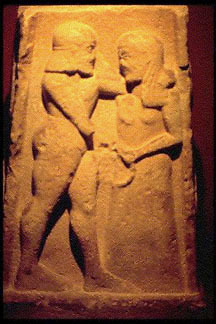 Other people have conjectured that it shows Agammemnon, brother of Menelaus, getting to grips with his wife, Clytemnestra who was the sister of Helen. But in the myth, when Agamemnon returned from the Trojan War, his delightful wife, together with new live-in lover Aegisthus, was waiting for him with an axe. She first ran him a bath, then netted him, then sliced him. It could of course be Orestes, son of Agamemnon, skewering his mother for what she did to his father. We study this delightful family and their torrid affairs in Aeschylus' play Agamemnon .